If you're into table-top gaming, G+ is a pretty good place to be. I've noticed something in my broader stream. It's full of a very specific type of failure. Do you know what I mean? Can you name a single creative from the modern era, who only produced one "great" work? 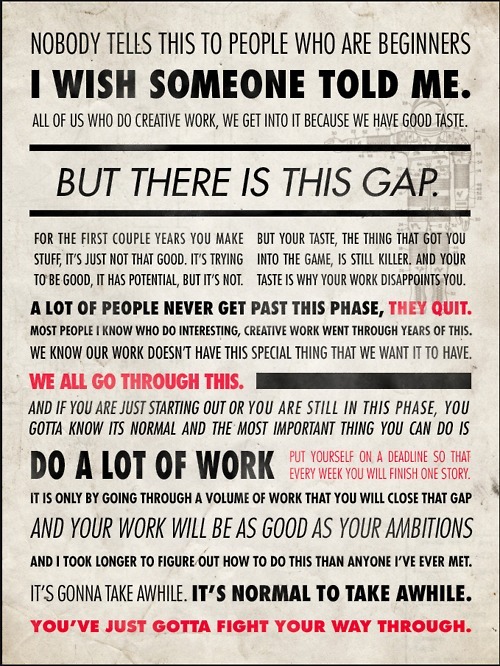 I see many, many, people in my stream who talk about how they have been working on their 'great' project for years. Sometimes these projects even finally get published, to the great unwashed "MEH" of the internet. Design is an iterative process. Not great design. Just Design. If you're spending all your time working on your great novel, or your role-playing game, or your board game, or whatever, but you never actually produce anything usable then you cannot grow as a designer. Your work will remain tepid. The thing is, the idea isn't that great. Really, it's been done before. And it's quite likely you are doing it badly. I say this with a great deal of confidence, because you can't even begin to do it well, until you have a few dozen examples of your work under your belt. You see, the elevator pitches for the Cohen brothers movies are terrible. "A divorce lawyer and a gold digger fall in love", "We retell the odyssey using 19th century criminals", "A stoned bowler gets mistaken for a different person". No world saving, huge action, robots, or secret to be exposed lies in those plots. Just interesting things done well. That's key. The idea will not carry you through poor execution. Think about the designers you like, and notice how they are constantly producing things. Also, notice how they are successful. So do things, release them, and repeat until they are done well. Also, for goodness sake, please stop posting about what you are going to do and why you aren't doing it! I have a really great comment on this, but I'm completely swamped right now. I might post it next week or next month, but I wanted you to know I'm still here and still thinking about it. I can only say: absolutely true. Go out there, keep falling down ... what separates the winning ideas from the failures (and there's a lot of those) is that some guy is "dumb" enough to keep picking himself up, dusting himself off, and having another go. To make a winning product you've got to be "dumb" enough to say the heck with what everyone says, I'm gonna do it. Also consider that there are varying levels of investment when it comes to this (well, any) hobby. Not to mention varying levels of self-discipline. I would much rather stay on the hobbyist side than the full-time (or even part-time) professional side of RPGs. The stress/anxiety associated with my job is why I come back again and again to the soporific well of D&D. If noodling with games becomes a job, too, then I'll probably have to start taking (more) drugs. I'm not much of a G+ user; can you recommend good resources to follow? The RPG blogosphere really puts "your great idea" in its rightful place. Which is right behind everyone else's. I used to work in gaming biz dev. I would get the "one great idea" sort of pitch all the time. (usually it wasn't really that unique, it was derivative of something else). The guy would pitch you the one idea, and you would like it or not, then you would say, "That's cool, so what else you got?" Then their eyes go wide. You know when you meet a real game designer? When you ask that question and the 3 ring binder with their 5-10 other great ideas come out. 10,000 hours to be an expert, and all that. Don't stick to one thing, Get a body of work. I once had the pleasure of attending lectures by a great and successful writer, who was lecturing on the process of creative writing. He said that the biggest fundamental mistake made by most new writers is the belief that you need to have an original idea. He said that writing is a series of learned tricks and methods (passed down through the development of our language of choice), which have to be used, re-used, combined and re-combined to create something of value.